I used to advise people to find the extra meaty ones and the ones I was able to get ended up great even though they were extra meaty but after a lot more testing, I've come to the conclusion, that the ones with a little less meat are actually a better purchase. In essence, the extra meat is pork loin left attached. Pork loin is very lean and is best cooked by itself and finished at a much lower temperature. 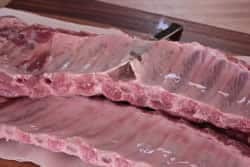 With more knowledge about the butchering of pork ribs, I now recommend the less meaty ones for a more consistent flavor, tenderness and juiciness. 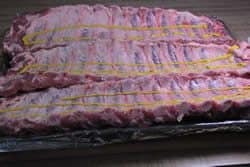 If you do happen to get ahold of some extra meaty baby backs, it may be smart to sprinkle about ½ to 3/4 teaspoon of kosher salt on the top side and let the dry brining process do it's thing. 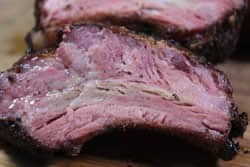 the salt will pull juices to the surface and then that salty mixture will reabsorb back into the meat giving you more flavor and because it denatures the meat, it will hold more moisture during the cooking process and they will naturally end up more juicy as well. 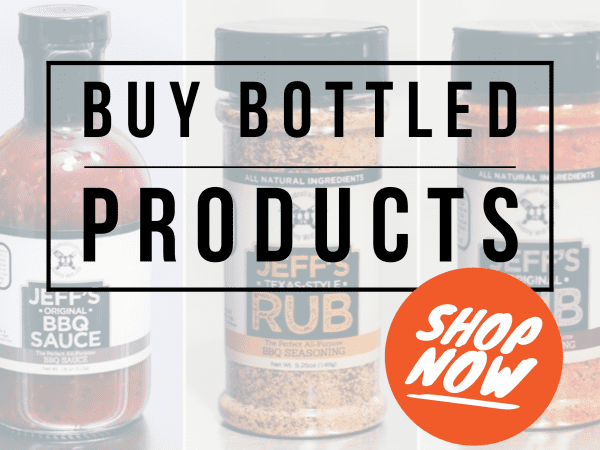 My rub is good on almost any kind of meat but, it was especially designed for pork ribs and, true to it's mission, it seriously rocks these smoked baby back ribs like nobody's business! Normally the first thing you do to pork ribs is to remove the membrane from the boney side. 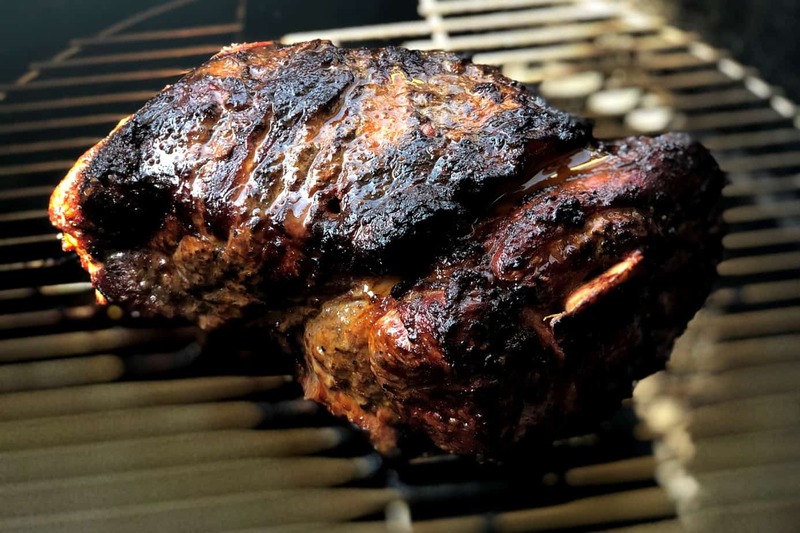 This is not something done in restaurants usually but it's one of those things that makes homemade barbecue so much better than what you can find commercially. To remove the membrane, place the pork ribs meaty side down. Insert a semi-sharp object under the first layer of membrane and pry it up until you can get ahold of it. Grab it with a paper towel if you need to in order to get a better grip. Pull the membrane clean off. Apply a thin layer of yellow mustard onto the bone side of the ribs to help the rub to adhere to the ribs. Sprinkle enough of my rub onto the ribs to cover the meat well. 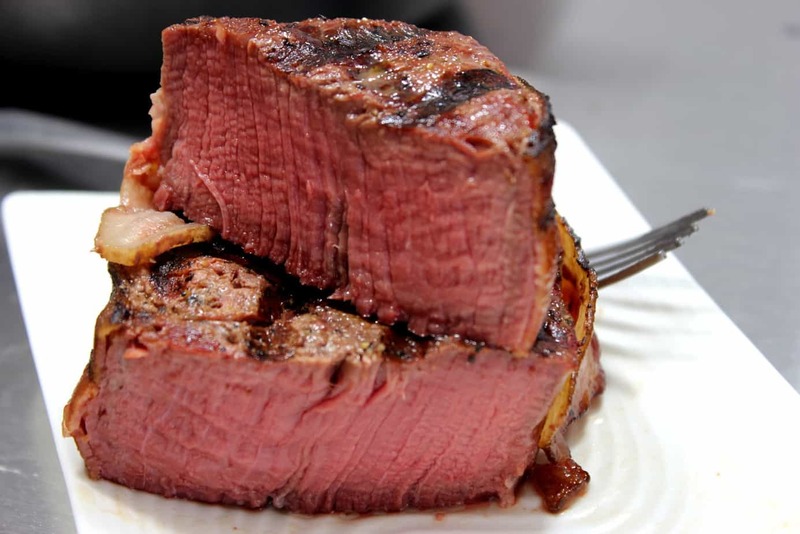 You should not be able to see the meat if you do it correctly. 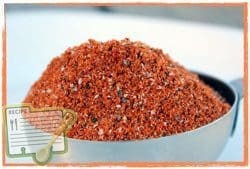 My rub is low on salt and high on flavor that compliments ribs extremely well. 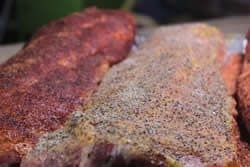 Let the rub sit on the bone side of the ribs for about 10 minutes or until it starts looking “wet” which means the rub, mustard and pork juices have mingled to create a nice paste. At this point, turn the ribs over and repeat the same mustard and rub application to the meaty side of the ribs. 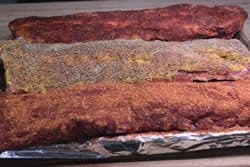 You will notice that I used the original rib rub on the outside racks and my new Texas style rub on the one in the center. All of them were good but I still think the original rib rub is hard to beat for pork and most other things when it comes to that perfect balance between sweet and spicy. 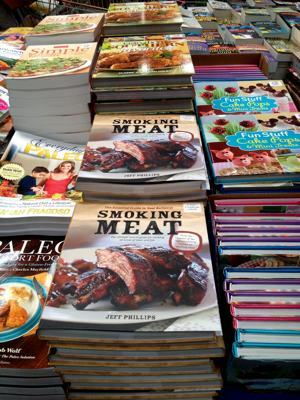 Leave them sitting on the counter while you go out and get the smoker ready to smoke. In my opinion, ribs do best at low temperature between 225 and 240°F. For these, I recommend staying as close to 225°F as possible throughout the entire cook time. 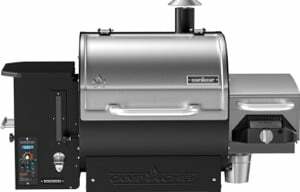 Set up your particular smoker for about a 5-6 hour indirect cook making sure to have enough smoking wood for at least 2-3 hours of smoke. If your smoker has a built-in water pan, use it. Once the smoker is up to temperature and ready to go, go get them ribs. Place the ribs bone side down directly on the smoker grate. If you are short on space, you can use a rib rack if you need to. 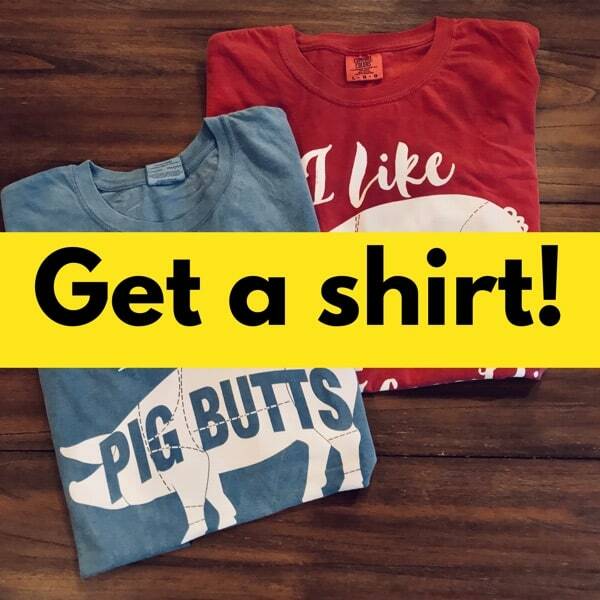 These allow for a lot more ribs in a smaller amount of space. Smoke the ribs until they are as tender as you like them. This will probably take about 5 hours at 225°F or perhaps an hour longer if the ribs have a little more meat on them. To check for tenderness, pick them up on one end with a pair of tongs and if they almost bend in half and start to break, they are probably ready to eat. Place seasoned baby back ribs directly on smoker grate for 2 hours at 225°F. 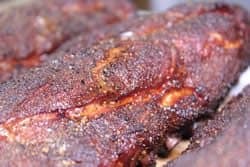 At the 2 hour mark, wrap the baby ribs in foil or place them in a foil pan, spritzing the ribs with apple juice just before closing them up or covering them with foil over the top. Cook the ribs at 225°F for 2 hours in the wrapped configuration. 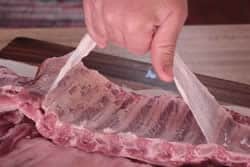 At what is now the 4 hour mark, remove the ribs from the foil and place them back onto the grate to continue cooking for an additional 1 hour to firm up the bark and finish them off. This is also a great time to sauce them if that is how you like them. To summarize: The first 2 hours smoke the ribs, the 2nd 2 hours tenderize the ribs and the final hour creates a nice bark and allows you to sauce them if you like. This process is known as 2-2-1. 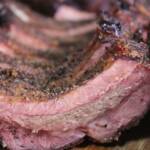 It's a great sequence and it works really well if you love really tender ribs. Note: If you are able to find the extra meaty ribs, you may want to add an extra hour to the first stage of this process making it 3 hours on the grate, 2 hours in foil, 1 additional hour unwrapped. This is the same sequence and times used for spare ribs which are equally meaty. Once the ribs are tender to your liking, remove them from the smoker. At this point they can be wrapped in foil and kept warm in the oven for a couple of hours or you can get busy slicing and serving. To slice, I have the best luck turning them meaty side down so I can see the direction and location of the bones. This allows me to slice right between them with great accuracy. Figure on about 2 to 2.5 eaters per rack of smoked baby back ribs.. for my family of 5, I normally smoke 2 racks and perhaps a 3rd one if I am feeling generous or want leftovers. 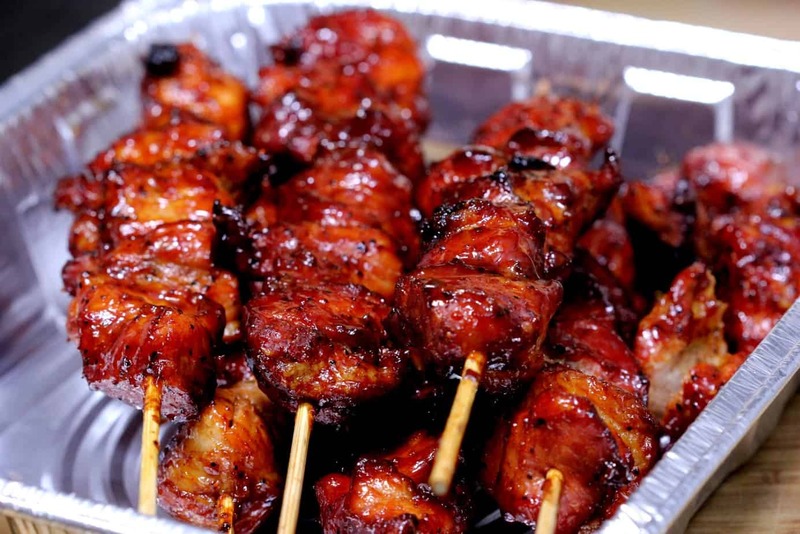 Serve with some of my barbecue sauce on the side for best results. 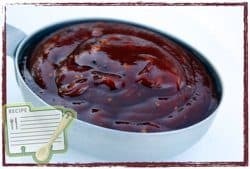 This allows folks to try them with just the rub (my favorite way to eat them) and if they just have to have sauce (some folks do) they have it available. I almost never check temperature on ribs of any kind but, if you must know, they are usually done at about 185°F or so. Be sure to smoke ribs with indirect heat. 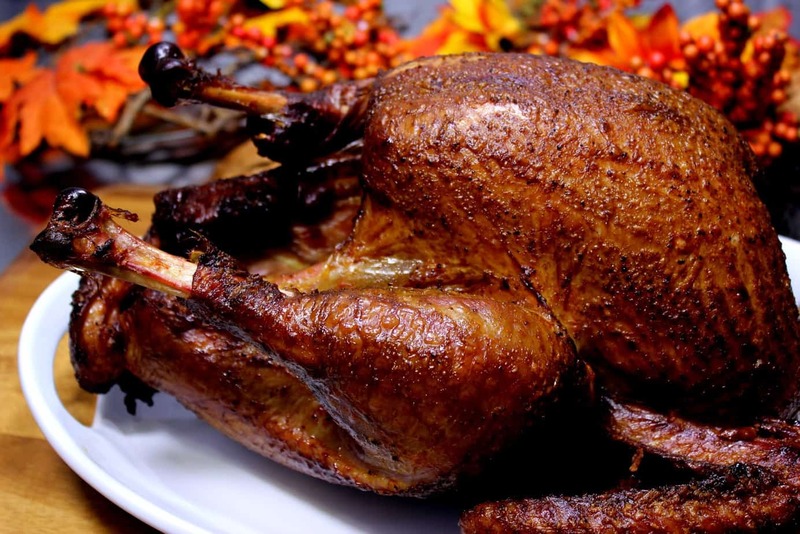 If you have any radiant heat getting to them, they will burn during this long cook time. 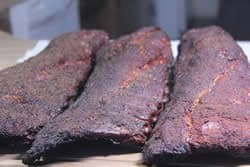 This goes for almost anything but you really want ribs to look nice and this is best achieved by keeping them in indirect heat the entire time. 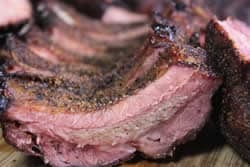 Smoked baby back ribs are what great barbecues and summer time get togethers are made of and with this recipe, you'll be the talk of the neighborhood. Sauce the ribs about 30 minutes before they are finished for best results. 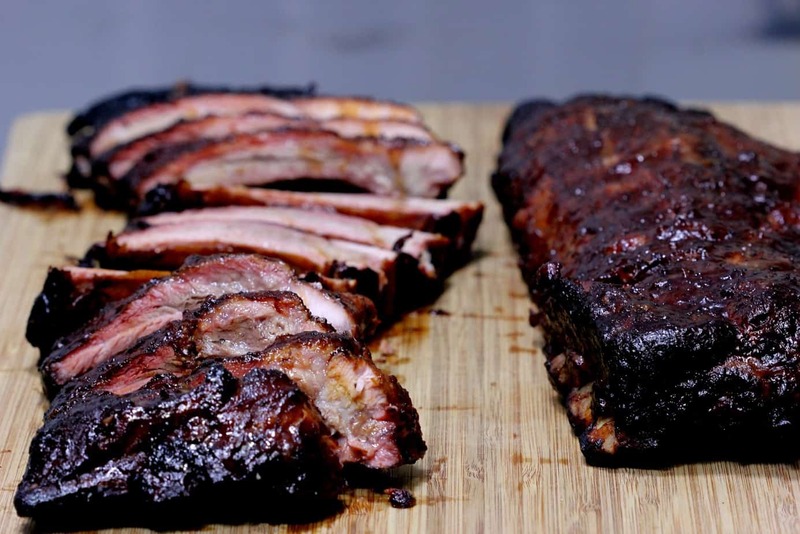 When the ribs are finished cooking, remove them from the smoker, slice 'em up and serve. 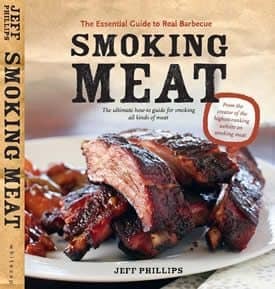 Jeff, I was wondering if you can provide what the internal meat temps should be at any given stage. 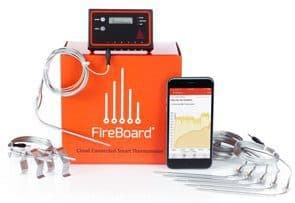 The engineer in me wants to measure, test, and validate. For example, I tried a 3-1-1 method yesterday. I smoked 2.2 lbs baby back ribs in a 225 F smoker for 3 hours and the internal temp was already at 187 F after 3 hours. I am thinking that if the internal temp was that high, that 3 hours was too much. 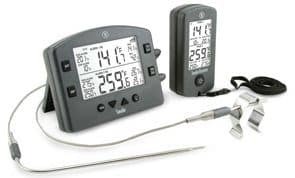 I know that the collagens break down at a certain temp but I am trying to understand how long the meat needs to cook at a certain temp before they are done. 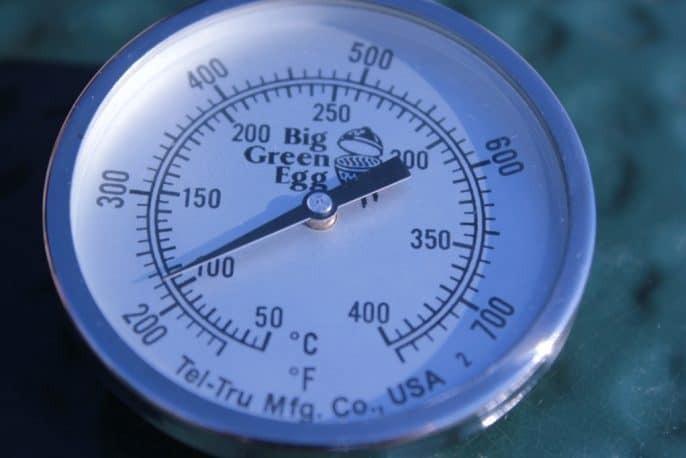 Can you give any guidance such as 1. smoke at 225-250 for 3 hours or until internal meat temp reaches X degrees F. Then wrap in foil and cook at 225 F for 1 hour or until internal meat temp reaches X degrees F. Then unwrap and continue to cook at 225 F for one more hour or until internal meat temp reaches X degrees F.
Jerry, I totally understand. Ribs are not something that we have used temperature on until recently. The idea is that the meat is so close to the bone, it’s really difficult, but not impossible, to get an accurate reading. Most just cook ribs by tenderness and time. I agree that this would be a great thing to know and I will work this into a future newsletter very soon. 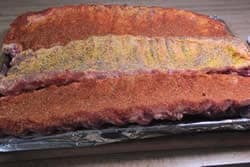 I tried some “extra-meaty” baby back ribs on my pellet smoker yesterday, Memphis style — that is, rub and mop, but no sauce, and no wrap. They weren’t as good as I had hoped. I think the higher ratio of meat to bark in the “extra-meaty” reduced the overall flavor intensity. B) using a smoking tube with extra pellets for the first couple of hours. Jeff, i’m new at this — do you have any thoughts? thanks in advance. I would try to find baby back ribs that are NOT extra meaty. As it turns out, this is a marketing term that just means they left some of the pork loin attached. Pork loin, as you probably know, is very lean and when you cook it past 145°F, it gets dry and tasteless. There is no place for that on a slab of baby backs. Purchase the thin racks that are just baby back meat only and you’ll end up with better flavor and more tender and juicy meat. 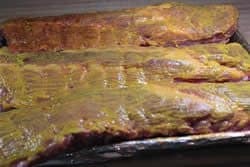 Wow – this was my first time smoking ribs and I did the 2-2-1 technique and it was AMAZING! My wife bought me the Franklin Manifesto for Christmas and he only had a technique for Spare Ribs. So I checked your site as I have read other recipes on here before and it seems like you knew what you were talking about. Glad I went with your recipe! I will be buying your book next! Thanks for the great directions. Jeff I finally got to use your sauce and rub on some ribs last night I will say well worth the 18.00 we really liked it. 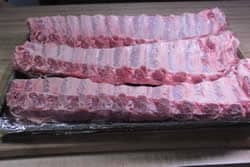 but the price difference between baby backs and spare ribs the trim down to a meaty St Louis cut causes me to choose spare ribs every time I am really looking forward to trying your rub and sauce on my next batch. Both have really basic ingredients. so it must be the amounts that set them apart from all the others?